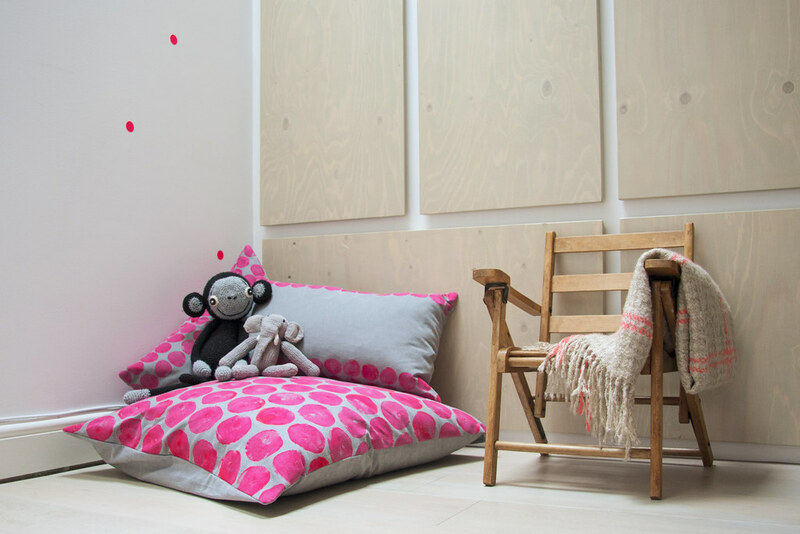 So just before the weather warmed up and the high street got flooded with neon pink I was already decorating my daughter’s room with a pink colour pop. I wanted some new cushion covers but couldn’t find any to fit the bill. 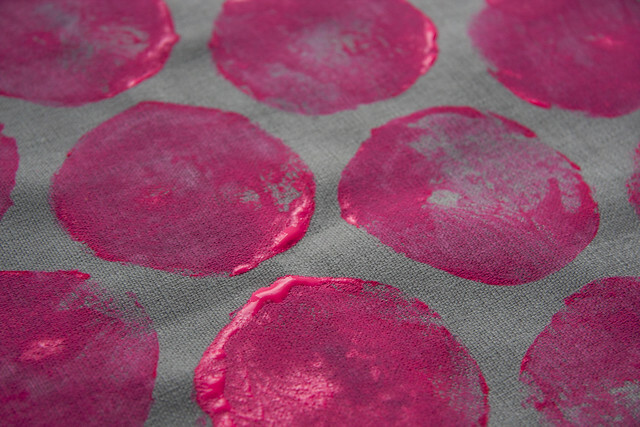 Inspired by this cushion on Ferm Living’s blog post and watching Emma’s potato print wrapping paper demo, I thought I would give it a go myself with some neon pink fabric paint and some leftover pieces of grey linen. Here’s how I got on and what you need to make your own. 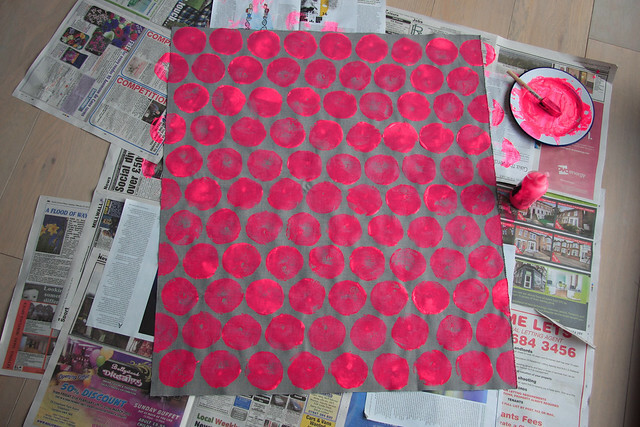 Fabric pre-cut for each side of cushion Potatoes, cut in half BBQ skewer or similar sharp stick Kitchen paper Fabric paint: because I wanted covers for floor cushions I chose this type, which sits on the fabric rather than being absorbed into it. 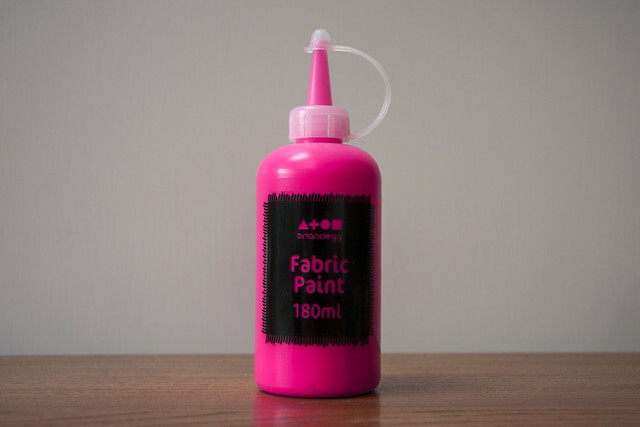 However, if you wanted to make a pillow or duvet I would recommend a fabric paint which leaves the fabric soft, such as this. Dish, plastic plate or take-away container to use as a paint palette 1. 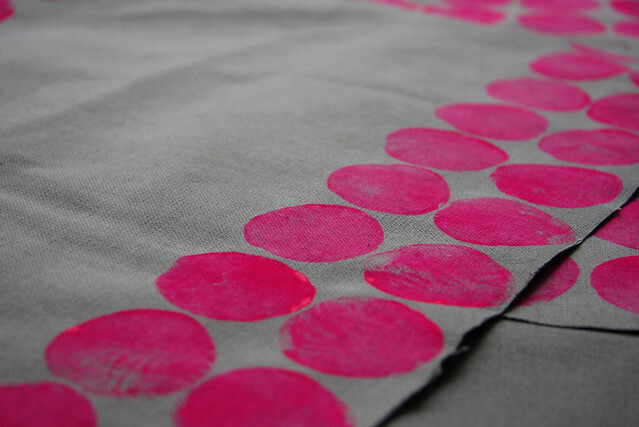 Lay out your fabric on newspaper and make sure its flat – I decided that I would take my prints over the edge of the fabric to make it look more seamless once sewn, but I recommend you do some experiments on a scrap piece first so you know what to expect. 2. Cut a potato and insert your stick into the potato; the stick will give you something to grip onto. 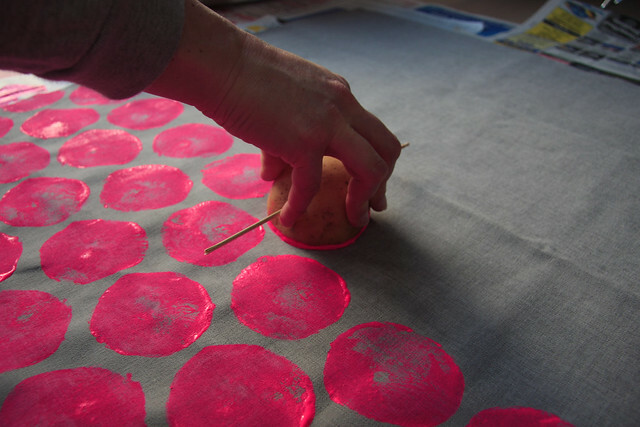 I found my large potato quite tricky to handle so learn from my mistake (a fluoro pink mess on underside of cushion) and do this before you start printing! 3. Try to dry off the cut side of your potato on kitchen paper before you start with the paint: it gets slightly starchy when it mixes with the potato so keeping the potato as dry as possible is good. You might need to do this in-between prints too. 4. 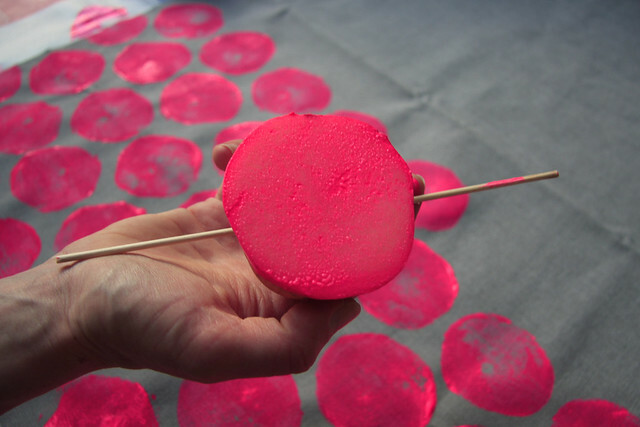 Squeeze paint onto your dish, stick in the cut side of the potato and make your first print – now the fun begins. 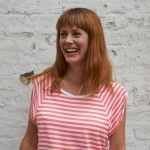 Tips: Map out a pattern before you start: I found it easier to work left to right and top to bottom as I am right-handed. 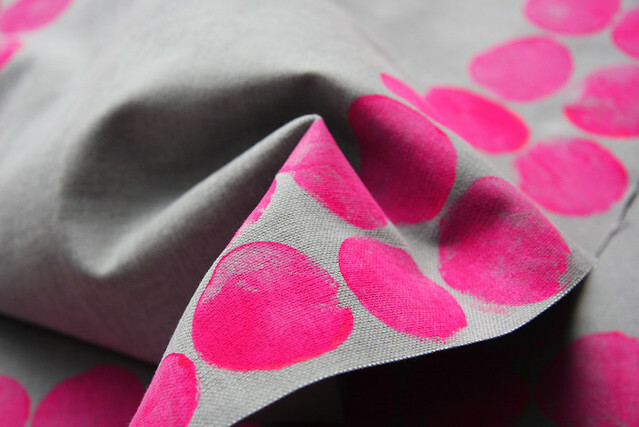 Don’t expect each print you make to look the same or be the same size; the potato will move slightly and the amount of paint on the potato will probably not be even, but this is part of the look. I think the results look great and my daughter has really taken to sitting on the cushions in her reading corner. 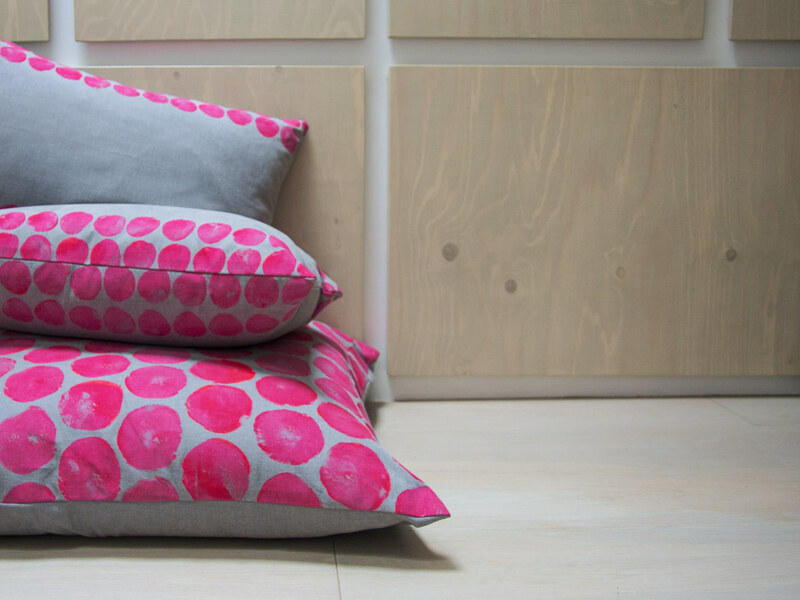 Success – and even with neon pink for sale everywhere I can be sure my cushions are one of a kind!